Here are the 2010 Los Angeles Reader's Choice results for categories dealing with headshots and demo reels. To look at all of the categories, be sure to visit the main page. "Most people tell me they love the way the eyes pop in my photos," shares David Muller, who attributes the compliment to his use of lighting. Muller, a relative newcomer to the L.A. headshot scene, started shooting four years ago in friends' garages and staging guerrilla shoots around town and now has his own studio downtown. Before becoming a full-time photographer, he worked mainly as a commercial actor and print model, originally in New York and later in L.A. He recently decided to retire from acting to concentrate on his photography business full time. Muller describes himself as a bit of a perfectionist when it comes to shooting. "I'm never content with what I'm doing," he confesses. "I always have to try to take it to the next level and be better than I am. I think that kind of hunger has helped me a lot." One look at his online gallery and you can see the attention to detail he pays to his work. As for current trends he observes in the marketplace, Muller says actors are expected to convey specific looks in their shots. "Actors need to get a much more diverse range of looks than they used to," he explains. "Now, with the majority of [casting] being online, it's much more important to be specific, because casting directors are looking at a thumbnail gallery. Actors need to suggest a character that they're going for. It's not enough to just have a headshot that looks like you." 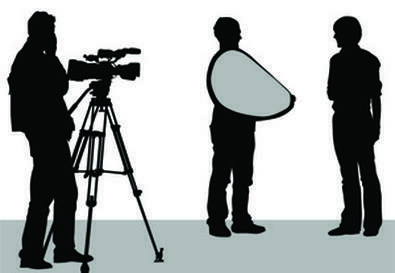 Muller advises actors to come prepared to their shoot and to not be a passive participant. "You have to know what you're going for," he says. "And here's a chance where you have complete control if you want it. You get to show the world, 'Here's what I can look like as this character and here's the energy I can bring to it.' "
He offers a variety of packages depending on one's budget. Rates begin at $300 for two looks. "David is an actor's photographer. He doesn't believe actors need to pay exorbitant fees for a great shot. My headshots from David got me an interview with my current commercial and theatrical agents." "After nine headshot sessions in five years, I have finally gotten headshots I love, thanks to David." "He was very easy to work with and always offered great ideas and directions while also listening to your vision." "Fabulous use of light, shadow, and color. He knows exactly how to make his subject look his or her best." "David is a very professional and super-friendly guy. He is fun to work with, and the results are amazing. I would recommend him to anyone looking to get great headshots in a relaxing environment for a killer price." "My headshots are amazing. They've gotten me so many auditions and so much work. And David is great to work with—flexible, no-nonsense, gave me exactly what I needed." Paul Smith considers himself part psychologist when it comes to shooting clients. "Everybody brings in different energy," he says. "As a photographer, it is my job to capture that energy in real moments to help represent that person truthfully. I joke with my wife that I am not only a photographer to my clients but also a psychologist, with the exception of having just one session to figure out my client and understand what they really want from the shoot." What matters most to Smith, an easygoing Aussie who has been shooting L.A. actors for 14 years, is that clients walk away from the shoot with everything they need. While it helps for actors to know their type and what looks they hope to convey, Smith is also happy to help guide newbies. "If you have a good photographer that's experienced and you have faith in each other, I don't think there are mistakes that can be made," he says. "It's a two-way street. I will bring in my game, and I expect my clients to do the same. If I'm working with somebody that's new to the business, I try to cover all the bases—so that whatever agent they get, they don't have to go back and shoot more stuff. People that are veterans usually come in with very specific ideas that work for them, and we get that accomplished too." As for what makes his shots stand out, Smith reveals that the mouth plays a big part: "Everybody says it's the eyes, and the eyes are absolutely important. However, I believe that what is happening in the mouth is equally important. I feel like if the mouth is doing something, then the muscles in the face change the shape of the eye. I call it the 'Mona Lisa' effect. You know when everybody's looking at that picture, they're like, 'What is she thinking?' She's not thinking anything. Her mouth is moving up. Okay, maybe she is thinking about something, but there are those decisive moments that can make or break a picture. If you don't press the shutter at just the right time, it's not going to work." "After several stagnant years, I shot with Paul and haven't stopped auditioning." "He is down-to-earth and fun. His studio is flowing with relaxed and loving vibes. He shoots you in the best light and with a simple, elegant background. He is, hands down, the best I have ever shot with in L.A. I met with the CD of 'Entourage' and the first thing she said was, 'What a great headshot!' "
"Just incredible. You cannot take a bad picture with Paul. He truly captures your individuality." "Paul's work is fantastic. My call ratio went up immediately." "He does a great job of making you feel comfortable and happy during the session. He lets you look regularly at the shots as they're being taken, so you get a great idea of what kind of work you're doing. Totally worth every penny. I've gotten great feedback on my headshots so far." "Totally knows how to capture the essence of an actor in a sophisticated and contemporary way. His studio reflects his personality—totally cool." "For one or two looks, Paul is amazing and under $400!" "I consistently get, 'Your shots are amazing! Who did you use?'" Matt Draper of SpeedReels knows how important it is to make a good impression—and quickly. His company and website specialize in creating the best 60-second clip of an actor's work; they even drop the clip on the Web with its own snazzy page. Draper, who began editing reels for the mega-agency ICM, recognized that the one-minute bite was the perfect way to grab the viewer's attention. "I saw how much easier it could be if reels could be online," he says. "On top of that, I saw firsthand that agents and casting directors would rarely watch more than a minute." An added benefit to the service is the setup of the website, which allows casting directors and producers to search for talent. "An actor fell out of 'Mission: Impossible III,' " says Draper "and they found an actor they liked on SpeedReels. J.J. Abrams liked what he saw and cast him. There are probably hundreds of other stories similar to that one." For 22 years, Argentum Photo Lab has been catering to the Los Angeles acting community and its marketing needs—first with printed headshots, later with résumé services, and more recently expanding the business to include website design. Argentum also preps headshots for online submission to casting directors. "We strongly believe that when somebody does a search to cast something, and 12 or 15 or 24 thumbnails pop up on that computer screen, your little thumbnail picture has got to grab their attention," says Ajay Jhaveri, Argentum's owner. "It's got to intrigue them. And that's not going to happen if the picture has not been prepped and optimized for the Web." Although a number of competitors offer services similar to Argentum's, what separates Argentum from the pack, according to Jhaveri, is its staff. "Everyone's got the same computers, software, machines," he says. "They don't have the people we have. You walk into most labs and it will be one front-counter person, and you may have to wait 10 minutes before you can speak to somebody. We have eight front-counter people. So customer service is a big, big deal for us." Jhaveri has seen many now-recognizable actors walk through Argentum's doors, but he is most excited to see client Eric Stonestreet's current success. The breakout star of ABC's "Modern Family" has been bringing his headshots to Argentum for more than a decade. "He's more than a client and a customer; he's a friend," says Jhaveri. "We've seen him approach this business very methodically—always training, always working on his skills, getting great professional pictures done. And of course having us print him the best-looking pictures. And to see his success is very heartening for us."